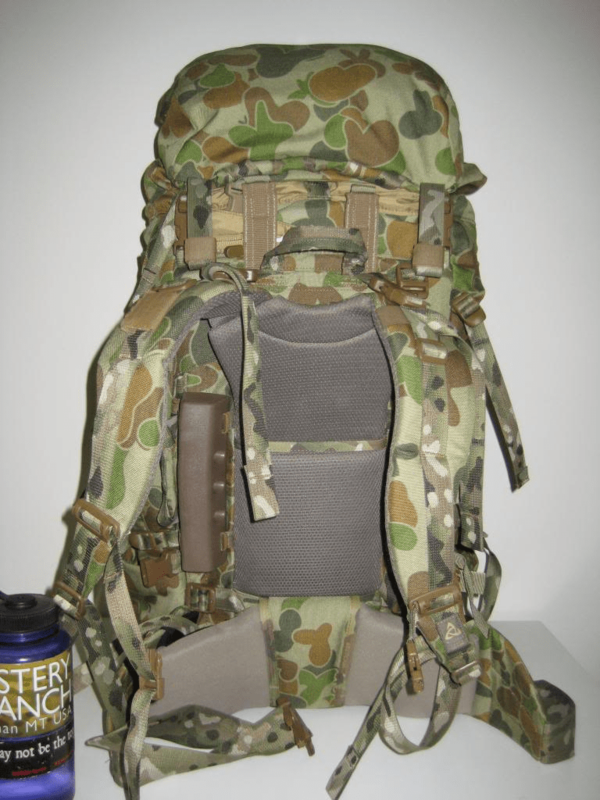 An 85 litre, general purpose combat pack with external pockets using the NICE Frame. The new DG-6 is kindly supplied by Crossfire Australia. This is the latest incarnation of the Crossfire general purpose combat pack. Unfortunately, I haven’t been able to take this pack out scrub, due to the vagaries of real life. 1000 Denier cordura for the main body. This pack uses the Mystery Ranch NICE Frame. It’s a hybrid internal and external frame. Experience has shown the NICE system is very comfortable against the body. This NICE frame is fitted with removable BVS blocks for integration with body armour. Something to note about this AUSNICE frame, is the lack of quick release buckles for the harness. I have mentioned this lack of quick release buckle to the team at Crossfire and apparently they are moving to instigate quick release buckles into the next production run. Crossfire has decided to go with Multicam webbing tape for their NICE frames. This looks “dirty” or mismatched, but really will help with camouflage and concealment by removing obvious straight lines from personal equipment. I think this is a good point, since my initial setup of bush gear is a quick spray paint to break up any obvious straight lines that webbing tape always provides. In general design, the DG-6 rucksack is based upon the same format as the Mystery Ranch 6500, scaled down to suit the volume, with many smaller details added. This is part of the licensed business alliance between Mystery Ranch and Crossfire. The DG-6 comes with an improved daypack lid. The pack lid is a detachable item that can be used as a small daypack. It could conceivably be used as an Escape and Evasion bag for those moments when immediate survival items are needed. It is secured to the pack frame via lockable fastex clips at top and bottom and has a harness system tucked away in a pocket for immediate use. There are extra fastex buckles to allow a more comfortable fit of the daypack harness. A nice design point on the fastex closure for top and bottom of the lid is the ability to undo the top portion for access to any radio controls, without having to muck around as much with the pack. This also allows the pack lid to be adjusted for the internal load and not interfere with the wearers head movements. The top zip pocket of this lid has an access port for a hose, so this would suggest that it’s intended for storing a hydration bladder. One could easily carry a 3L bladder within it. The positioning of the pack lid is such that if a hydration bladder is fitted, that it’s in the most optimal balance point. These pockets on the Daypack Lid are larger and better shaped to better allow a variety of different items to be carried. This increases the usefulness of the Daypack Lid. The top pocket is sized to accommodate water bladders and other such items of equipment such as complete M18A1 Claymore anti-personnel devices. The second pocket, lower down on the lid is for carrying such things as rain coats. There is an internal zip accessed pocket inside for small sundry items. All these extra features make the daypack lid more useful as an actual daypack or E&E pack. On the outside of this pocket, is a section of velcro loop material for IFF and morale patches. This is split in half by the signature Crossfire coverable patch of Scotchguard reflective tape covered with a roll cover. This allows the Scotchguard reflective tape to be covered or uncovered as necessary, to allow the poor bugger following along behind next in formation at night and other low visibility movement occasions, to have a visual reference point. This storm collar allows a much greater capacity to expand the pack capacity should extra equipment be carried. The storm collar has patches of cordura to aid in camouflage and concealment in close country. There is a fastex strap that gives a more secure method of securing equipment under the lid such as combat helmets and other loose items. Inside the main compartment is a significant amount of internal organization, as per usual for Crossfire packs. At the top of the pack are loops for Crossfire’s “Lost Arrow” system for hanging hydration bladders or radio harness. On the inner surface against the wearers back is a panel with MOLLE channels for securing such things as pouches and manpack radio harnesses. Along the inside of the rucksack are three velcro secured mesh pockets for organizing small items. Radio access from the outside into the inside of the ruck is conducted by three zips. There is one on the top of the pack, close to the harness. Another zip is on each side of the ruck. Each zip is fitted with dual zippers to allow a variety of handsets or antennae to be routed into the pack. The sleeping bag compartment at the bottom of the ruck has a skeletonised shelf to separate the main compartment. It’s not completely sealed off from the main compartment. The skeletonised sleeping bag shelf allows long items to be stowed within the pack. It was interesting to note that the skeletonised shelf is secured via Crossfire’s “Lost Arrow” system. The external surface of the rucksack has four external pockets on the back surface of the rucksack. Each pocket is secured by fastex clip, barrel-locked cordage and velcro patch. Very secure methods of closure, and can be applied to suit the paranoia level. It takes a load off one’s mind to realize that the only items to be lost are due to your own negligence and lack of attention to detail when not securing kit properly rather than equipment failure. The sizing of these external pouches was to prevent a user from overloading the pack, by placing inappropriate items in them, and over balancing themselves. This sizing is good for such day-to-day items as rations for the next couple of meals, toiletry and morning routine dilly bags and other small sundry items. The bottom pair of external pouches has a velcro secured kangaroo pouch-type pocket for stowing such items as hootchies (shelter sheets) or entrenching tools. Grommets are located on all bottom surfaces to drain any excess water you may have accumulated. On each side of the rucksack, is PALS channels for attaching external pouches. On each side are two compression straps, acting independently from the frame. These are the same design as seen on many Wilderness Equipment packs, in that they offer a two-to-one draw strength for ease of use. They are also removable, should that be required by the user. This could be extremely useful for certain emergency situations. Off the top of my head, I can see these being used for splinting walking sticks to limbs to treat broken bones or snake bite, aid in the securing of damaged equipment, or even lashing packs together to form a raft for water crossings. All this, as well as being able to compress the load within the rucksack and lash long bulky items to the outside of the pack. There is also one compression strap attached from the frame to the rucksack. This is the traditional compression strap location used by most other Mystery Ranch packbags. Down the bottom of each side of the outside surface, are pockets for catching any longer items, and can accommodate an entrenching tool being stowed. For this purpose, the pocket is lined with a double-lined, very abrasive resistant material. There is also a loop of material to allow stowage of the entrenching tool handle alongside the pack should this be required. Loops are fitted on all three external surfaces for stowage of such items as entrenching tools or other similarly sized items like star pickets. All straps have velcro to shorten and tidy-up any loose straps, preventing snags. The new model, new generation DG-6 is a return to the original Wilderness Equipment SAS pack – but with more modern innovations and user feedback. The old stalwart that was the Wilderness Equipment SAS Pack was an internal framed, external pocket general purpose combat pack that was considered as the essential pack to have as an armed professional when I was but a young, dopey digger. The original Crossfire DG-6 was a development of the Wilderness Equipment SAS pack, but was evolved in a slightly different direction by using the DEI MOLLE frame. The lineage continued with the pure internal framed DG-3, and now returns full circle with the new AUSNICE formatted DG-6. I’m very pleased to say that I have had a minor role in the development of this pack, providing some end-user experience and feedback for the design team. I have been able to take the new DG-6 on training walks around town. Walks have been conducted with and without armour, and with fighting load of a chest rig being worn. Of course, for such a high quality piece of kit, no real surprises were found. Although it should be noted that being worn with body armour (in this case, a Banshee Plate Carrier) in conjunction with the removable BVS blocks still made for a relatively uncomfortable experience, the BVS NICE frame at least makes it more bearable. If I was to do it all over again, and lose what sanity I possess by returning to the service, I wouldn’t hesitate in obtaining a DG-6 in its current format for work use. The beauty of the NICE frame system from Mystery Ranch would mean I would use the DG-6 packbag for work, and the Wolf Alpha for my own time, and just swap the NICE frame from each as circumstances require. The new model DG-6 still follows basic tenets from the old version, by allowing unimpeded scanning by the head, and being sized to fit well within the shoulders for movement through close country. As per usual for a Crossfire product, the DG-6 is a very high quality item. Construction quality is high, and end-user feedback from an Australian perspective has been further incorporated into this design. Such small details as the storm collar allows much easier of expansion of pack capacity should extra equipment be carried. All of this now brings the venerable DG-6 design into what I consider its pinnacle. Perhaps one of the biggest things that I feel stacks against the new DG-6 is the main body material. Since it’s made of 1000 Denier Auscam cordura, this adds significantly to the weight of the pack. It does provide amazing durability and toughness, but I’d prefer to have the pack material in a lighter weight, preferably in 500 Denier or lighter. But I do realise that it is rather difficult to source DPCU (auscam) in a variety of material weights. It’s a very limited camouflage pattern in the world stage. So I would be very interested in seeing this packbag in a 500 Denier material. I am also disappointed that there are not any other colour choices as at this time. Some of us don’t need DPCU (Auscam) in their lives anymore. Whilst very good, due to its length, the AUSNICE frame may not be entirely suitable for those who wish to use or are restricted to traditional belt webbing. Also, due to the requirement to keep the packbag well within the shoulders of the wearer, this means the packbag has to be fairly deep, which could lead to overbalance issues on the wearer. This can be minimised however by correct packing methodologies, ensuring dense and heavy items are against the back, and lighter items further out. It was noticeable during the evaluation phase of this review that the multicam webbing tape seemed to be a little “stretchy” as a result of its construction. After some initial use, this webbing tape will stretch out and not be noticeable – a very, very minor point. As per any design from Crossfire, the attention to detail, and dedication to the end-user is fantastic to see. I consider the new model DG-6 AUSNICE as the one of, if not THE premier general purpose combat packs available in Australia. Decades of experience in design, and actual user feedback has resulted in this high end pack being available. A personal favourite of mine, as I feel it more than answers many requirements for real world use, without sacrificing comfort, adaptability or useability. Posted in Crossfire, Long Range, Military, Packs & Webbing by 22F with 12 comments. Nice review mate crossfire should be putting this on their website , as the advertisement they have for this pack was pretty sh!t when I bought it a couple of months ago( limited description and pictures). I had my heart set on this pack though when I remember you saying it was in the making. I’ve used it on a couple of ex’s now and I’m not a huge fan to be honest, there’s no way I can fit a radio in it when I have all my gear in the pack which is annoying when I have to carry a 500 around. The front pocket for the ET is pretty small and tight and doesn’t really work for me, I have to use one of the side pockets , and I swear my ET is going to rip the pack eventually as it’s so tight up against my sleeping bag. I wish the front pocket’s were just a little bit bigger as well. I love the frame though , especially the hip pads they take a lot of weight off the shoulders but this means I can’t use a belt rig with it , and stomping with TBASS is f#cked! Also why no multi cam !!! Tom if you’re worried about it being too small but like the frame, mebbe sell the bag, keep the frame (cut down on shipping from conus) & order a different bag from Mystery Ranch. They’ve got larger ones like 6500-7500 cu in for the nice frame. You can get multicam packs. I’ve got a 6500, suits my needs, but i don’t carry large commo gear. Thanks for the feedback mate! I just had to edit some of the naughty words, since I have young kids (children of my old mates) viewing this site. Thanks for your understanding. When carrying a radio, you shouldn’t be carrying all your kit and caboodle, stuff should be distributed amongst your team mates as well. I realise the E-tool stowage isn’t dedicated to that device, but I never had to carry one of those silly things for long periods anyway. When I needed to dig decent holes, we’d take fully sized pioneering tools off the car stowage racks for short durations. The external pockets are intentionally sized. It’s from my experience, and the observations of the designers that far too many Digs overload their packs with too much heavy kit on the outside. This can lead to spinal injury. If a pack this size is too small for what you’re doing, I’d suggest that your headshed needs to reconsider their logistical footprint and procedures to better reflect the real world. I have no idea about different colours availability mate. I would imagine that capital restrictions (like having enough money to actually buy material) and the most likely consumers actually want DPCU before other colour selections. Oops! sorry about the language ! Just did about 5 days of a proper light infantry ex with the pack and I have to say it is growing on me now that I’ve figured out how to utilise the different pouches. When I look around at all my mates struggling with uncomfortable packs that sit to one side, it’s made me happy that I spent a little bit extra for a more thought out frame. I’ve heard a few rumours that we will be getting rid of DPCU in the near future. So I think multi cam will be a popular choice soon. We just found out in the next month or so about a platoon of us are doing a trial on some new packs that they’ve been developing for infantry so I’ll try and get some photo’s for you’re interest. I’d be fascinated to see pics of the trial packs when you get to play with them mate. Keep me updated. The frame, the frame, the frame. Without a doubt the best feature of this pack by a country mile is the frame. It fits so snugly against your back, twisting with your back/hips as you go (instead of rigidly working against you like a static plastic/metal frame). It makes me smile as I go, knowing it is working as it was designed and saving my back. The waist belt works very well too, transferring much of the weight to your hips, making it easier to move and so you don’t walk around like a hunch-back. I used the waist belt even when wearing belt-order webbing. The capacity of the main pouch is impressive and provides plenty of room for spare clothing, winter clothing and whatever else (combat helmet when not using it, extra water etc). Whilst the pack had zips and things for access to a radio, thankfully we don’t use the big old sh!tty wagtails anymore, so whilst a bit obsolete they do provide easy alternative access to the pack. The sleeping compartment is also efficient. Very easy to quickly whip off the sleeping mat, pull out the sleeping bag, sleep and then stuff it all back in there in the morning. The daypack/lid is poorly designed. The upper side should be properly secured to the pack by way of a strong zip or some other fastening method. Having 2 fastex clips up there provides far too much leeway for the lid to move all over the place because it physically can’t be tightened any shorter than the length of the clips themselves. This problem is amplified if the main compartment is filled anything short of full capacity (as per your pictures above) which would otherwise give the daypack something to wrap around. If the main body isn’t completely full (as is often the case if you pride yourself on travelling light and efficiently) the lid will move around too much (or to secure it means pulling the front over the top 2 rear pouches which moves weight away from the centre of gravity). This problem is amplified if you try to carry equipment between the main compartment and the lid (such as spare machine gun barrels, M72/66mm, body armour and what-not) as is commonly done. The lid will be unstable and move all over the place, meaning whatever you’re carrying up there also moves all over the place. Not good, especially when everyone else is marching off with stuff up there sitting tight and snugly. Seriously, the utility of the lid being fully detachable (how often are you really going to use this function?) is far outweighed by how much of a pain in the arse it causes the other 99% of the time when you just want it to be there securely instead of flopping all over the place. Lack of quick-release straps. This is probably the worst thing about the pack, made all the more annoying as its almost inconceivable how the designers didn’t think it necessary to include them, for a pack designed for infantry. When you get into contact and the order is given to drop packs, you need to drop it and get into the fight asap. You need to be able to reach across with your non-master hand, un-clip the pack and have it come off your back as you step off. You can’t get this thing off your back without putting your weapon down. And then you still have to sort of jump it off your shoulders to get it to slide off. If you’re wearing belt order it is even harder as once you get the straps off your shoulders, it can’t slide off as it’ll sit on your webbing. So here you are in a contact, standing or kneeling, weapon on the deck, straps wrapped around your arms while you thrash about trying to get the bl00dy thing off your back (again, meanwhile everyone else dumps their pack in 0.5s and is charging into position). It’s inexcusable. Even the garbage standard issue 1994 pack which everyone hates has quick release straps, as does every credible competitor the DG6 is supposed to outclass. That such critical functionality is lost all because of the absence of a couple of fastex clips really is very poor. Not to mention quick-release straps allow you to put the pack on and off whilst maintaining a very low profile. Not enough external pouches. I found I very quickly filled the 4 pouches with rations and ancillary equipment, which dramatically reduces your ability to live on the outside of the pack. When you’re out field you don’t have time to be reorganising stuff from the main compartment to the outside because there wasn’t enough space out there to begin with. Again, competing packs have as many as 8-10 pouches on the outside which, whilst maybe too much certainly provides greater efficiency. Overall, I absolutely love the frame and whilst the pack itself clearly has potential, it is far from being “the final word” on infantry packs. The frame makes carrying heavy loads very comfortable and far less likely to cause you back problems, it’s just up to you to be fit enough to carry the weight. Howver, the 3 cons described above are pretty significant shortcomings to widely understood needs which are served by its competitors. To address these I’m going to be getting my pack modified to fit quick release straps, have the lid properly secured to the pack and get a few additional pouches for the sides of the pack. This is disappointing given the pack already costs significantly more than its competitors. Though that frame certainly is worth it. Please accept my humble apologies for editing your comment slightly to remove naughty words. I have younger children of old mates who read the site. Thank you so much for the feedback though mate! It’s greatly appreciated. There’s some good points raised by you that I wholeheartedly agree with. Ergo, there are some points that I will disagree with you about. External stowage (ie. External pouches): there was a lot of discussion about how much external stowage in the form of external pouches were to be used in the design. The big problem that the design team had, was to find a sweet spot that end-users were happy with. There’s also a big problem with external stowage: give too much to end-users, and the chances of the load being mis-balanced is greatly increased. If the load is mis-balanced, there are some serious consequences. This has some serious repercussions for design team. First among them is the old “duty of care”. The design team had a duty of care to preserve the spines of end-users. So they achieved this by engineering only a certain amount of kit to be carried externally. Sticking such things as those really big South African 1.5L canteens (or full ration packs) in the wrong spot can lead to severe balance problems. The unintended consequence of a mis-balanced load is that the interaction between the packbag/rucksack and the frame with the end-user can be negatively affected. In other words, if the fine balance of interaction between the rucksack/packbag and frame is affected, then that will significantly affect comfort levels of the pack to the wearer. So that the comfort you feel now, simply wouldn’t exist. The DG-6 would feel exactly the same as every other cheap pack out there. Hence why competitors of the DG-6 may have more external stowage, but be more dangerous for the wearer’s spine, and not feel as comfortable. The detachable day-pack lid was a requirement from certain original clients of Crossfire many years ago – and is still absolutely vital and required by that community. Those end-users required the detachable day-pack lid for use as an E&E bag should packs be dropped under fire conducting break contact drills, as part of their SOP’s. Those end-users stowed long objects on the sides of the pack, using the compression straps. The current iteration of the detachable day-pack lid is leaps and bounds better than the original DG-6 (reviewed by myself elsewhere around here) for usability and ease of removal. That it isn’t a perfect solution to stow loose equipment under was considered worth the compromise. Like most things in life, it’s all about the compromises that have to be made in design. Trust me, I still think it’s better than the original Mystery Ranch version. I will wholeheartedly agree with you about the lack of quick release buckles. I’ve been nagging Crossfire about this for a few years now. However, it’s not as simple as simply attaching some Fastex side release buckles. Quick release buckles need to be rated for the load. Never fear, every time I get to contribute to some design brainstorming for new pack designs with Crossfire, I keep harping on about them to the team. Now, the other problem with this pack and it’s harness is something that most end-users have no say what so ever over: it’s not really designed for belt webbing. It’s really designed for chest webbing of some description. The problem with belt order webbing, as you mentioned, is that it competes for space on the hips for the load bearing belt. Belt order also tends to retard the quick donning and doffing of the pack. Unfortunately, most of the army has no say in what fighting load they wear, they’re dictated by higher command who don’t realise what sort of technology and ergonomic development is out there now to make things more comfortable and preserve the force from spinal injury. Thanks for the response, given the date on the last comment here was worried I might go unacknowledged. Something else I forgot to mention: The hole on the daypack/lid for the camelbak hose is too small. It would fit the hose itself, but you can’t get the mouthpiece through it. Meaning I haven’t been able to use that function and have instead had to have the hose come out of the zip. Appreciate the desire for the lid/daypack to be detachable, just think that a sturdy zip (such as others used elsewhere on the pack) would be a better method of securing it so it doesn’t move, whilst preserving that functionality. I’ve worn the pack with both a chest-rig and belt webbing and agree it functions far better with a chest-rig. That said though, I always use the waist belt even with belt webbing. Sure it doesn’t work as well but it still gets plenty of weight off your shoulders and that is critical to me. I’m going away again in a few weeks for another exercise. I’m looking to have the pack modified before I go as I’ve described above. Will let you know how it goes. Yeah, apologies for tardiness mate. Quality time with the missus, working my backside off in minimum wage job (I’m on my second lay-off in two years, with the current position that effectively negates the last 15 years of my professional life) to keep the lights on and food on the table all cut into available time at the moment. Thanks for the feedback on the hydration hose. It will be passed onto the design team. I know where the mistake was made on that area: the Crossfire team is really big on the Source bladder system. I like it too, because the hose and mouthpiece are detachable. I’ll pass on your feedback, and ensure that the next version of the DG-6 (which is being worked on as we speak) will not have this problem. Thanks a heap for taking the time, it’s greatly appreciated! Even moreso because I can take this back to the designers for improvement of the product. Crossfire has started development of the new DG-6 version. I’m playing a small part in this effort. A great many suggestions from you mob have been taken on board and should be incorporated into the new design. So I scored one of these on ebay for $150 a steal! I really bought it for the frame but will give the pack a go. I’ve got to say in my experience crossfire always seem to get only 90% efficiency out of thier designs. All thier packs are in some way a descendant of the sas mk6 by wilderness equipment indeed alot of thier packs are designed by Ian Maley who designed the sas pack. Anyone who has read my other comments will know that I swear by the sas mk6 but nothing lasts forever and mine is getting towards the end of its lifespan so naturally I’m gravitating to crossfire for a replacement. But if something is as good as it can be you cant very well improve it. And thats what crossfire are trying to do. The original dg6 was an excellent bag on a pretty ordinary frame and without the excellent hip belt that made the mk6 what it was! The dg3 was awesome the internal frame was the same as the mk6 and the hip belt superb but the molle on the outside was poorly placed and the pack just didn’t pack quite as well as its ancestor. Now the dg6 ausnice. Crossfire closely modeled it off mystery ranchs 6500 military pack. The frame is of course excellent and the omission of the padding on the hip belt was a good move and the day pack lid is a good compromise between lid and day bag if only a little clumsy. The sleeping compartment is great and internally a good bag. But those four external pouches are utter garbage! They are too small to fit anything useful! South African water bottles, ration packs all too big so its just wasted space. The bag is the right size it’s just let down by poor pouch placement. If I can ever find an original dg6 bag I’ll be chucking this frame on it and I’d be one happy digger. Come on crossfire if you want to recreate the sas mk6 just remake it! They’re in the process of developing the DG-6 replacement. A sample should be winging it’s way over to me for initial examination very soon. I’ll let you know what I can as soon as possible.